Many people have a hard time walking away from their devices, even when they know they should. A study from GfK found that over a third of internet users worldwide agree they have a hard time disconnecting from technology. Younger users struggle most with technology attachment. In fact, nearly half (44%) of respondents ages 15 to 19 agree that it’s difficult for them to take a break from their devices. Respondents ages 20 to 29, and those in the 30-to-39 age bracket, were not too far behind in their agreement. Overall, few internet users under the age of 40 said it was easy to take a break from technology. Meanwhile, many older respondents—particularly those over the age of 60—said they didn’t have a difficult time breaking away from technology. Only 15% of internet users in that age group said they have trouble disconnecting. In the US, the findings were similar. Younger users were more likely than their older counterparts to say that it’s difficult for them to walk away from technology. Also in the US, the 60-plus age group had a significantly higher percentage (44%) of respondents who didn’t think it difficult to take a break from technology. That’s an 11-percentage point difference compared with global respondents in that same age group. But these differences in behavior by age aren’t surprising. Separate data from Safe Home, a home security ranking and review company, found that older people in the US would be more likely to give up on technology, or stop using it, if they felt it could be a threat to their privacy. Nearly four in 10 (38%) internet users over the age of 65 said they would not use a device due to a privacy threat, and nearly as many respondents ages 45 to 54 and those 55 to 64 agreed. 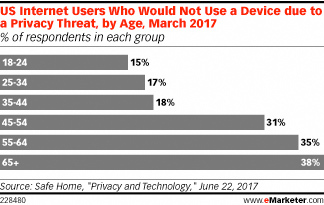 By contrast, fewer respondents under the age of 45 would stop using their device due to a privacy threat. For example, just 15% of 18- to 24-year-olds would end device use out of privacy concerns.